As email is to snail mail, snail mail is to carrier pigeons... or so you thought! 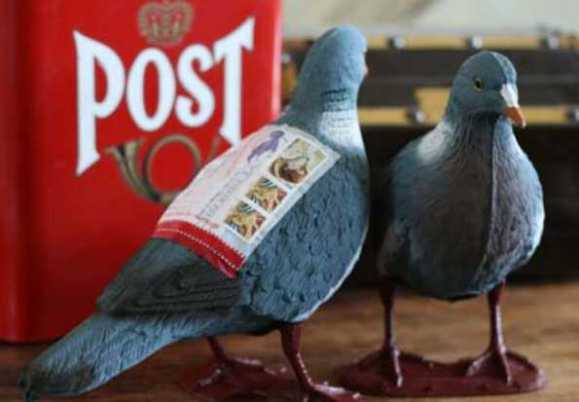 Pigeon Post, a mailable plastic pigeon from Letter Writers Alliance, turns the art of long distance communication on its head by rebooting the carrier pigeon concept. All you hipsters out there who think smoke signals, Morse Code and the Pony Express were more authentic ways to communicate over a distance are gonna take to Pigeon Post like a touch typist to a telegraph. The concept doesn't try to beat email at its game; instead it's an attempt to revitalize the art of letter writing by injecting a note of whimsy – and no pigeons are hurt, exploited nor made redundant in the process. Here's how it works: each Pigeon Post kit contains 1 Pigeon, 3 Pigeon Post message forms, 3 mailing label pouches, instructions on how to mail, and postage for one mailing (First Class domestic USA, $2.45). Put your message in the pouch, apply postage stamps, and toss the prepared pigeon into the parcel drawer of your local mailbox. Be advised that this may appear somewhat odd to onlookers unaware of Pigeon Post. Imagine the look of surprise and delight on the recipient's face as they take delivery of your Pigeon Post for the first time... one imagines the postman will share these sentiments. Each Pigeon Post kit costs $30. Once you're hooked on Pigeon Post, LWA offers refill kits containing 6 message forms and 6 label pouches for just $10 per kit. More details at the LWA website.